The spectacular growth in China’s retail sales has been accompanied by a surge in the sales of licensed merchandise. Among all the emerging licensing markets in Asia, the Chinese mainland was the only one to expand at a double-digit compound average growth rate (CAGR) during the period 2008-2013. The Chinese mainland’s CAGR of 14% is substantially higher than that of any other licensing market in Asia, establishing it as the second largest licensing market in Asia and narrowing the gap with Japan, the current front-runner. As the market develops, so too does the structure and respective roles played by the market participants, including licensors, licensing agents and licensees. 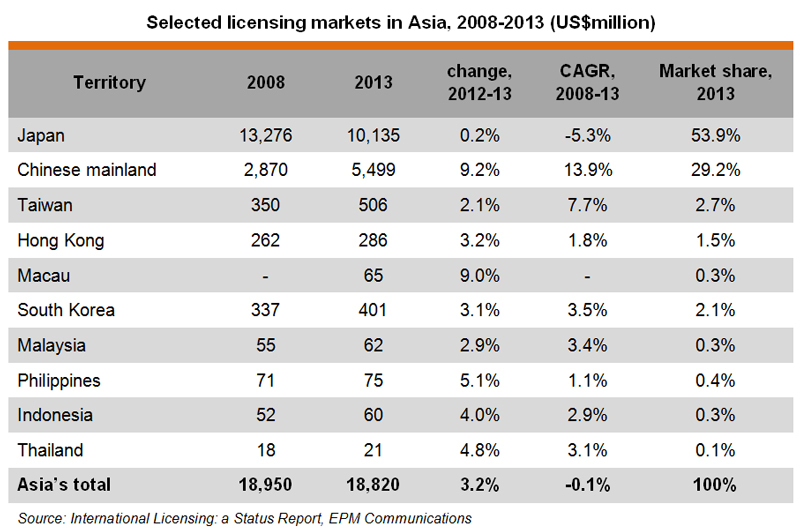 This article considers China’s booming licensing market, in particular from the perspective of the licensees. The Chinese mainland is rapidly gaining importance as a target licensing market, according to responses to an HKTDC Research licensing survey conducted in the first half of 2014. 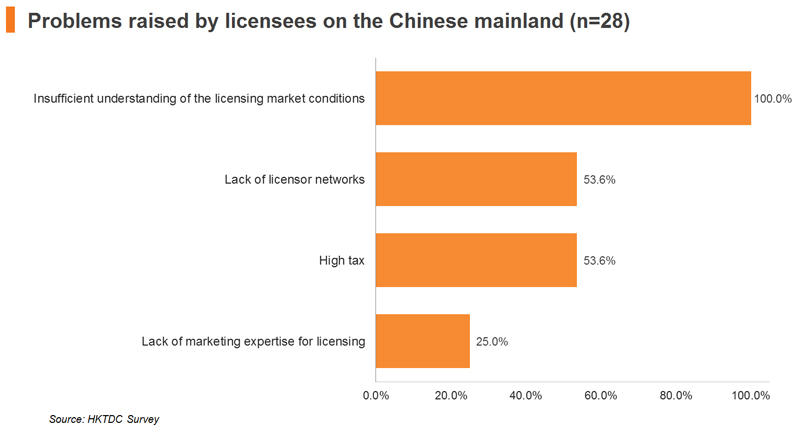 As the figure below shows, the Chinese mainland is seen as an important licensing market by at least half or more of the survey respondents, who comprise licensors, licensing agents and licensees from the Chinese mainland and from around Asia. All Chinese respondents were unanimously positive about the booming licensing market on the mainland. The optimism towards the mainland market is reflected in the yearly business growth reported by the majority of respondents over the past year, in particular the Chinese respondents. 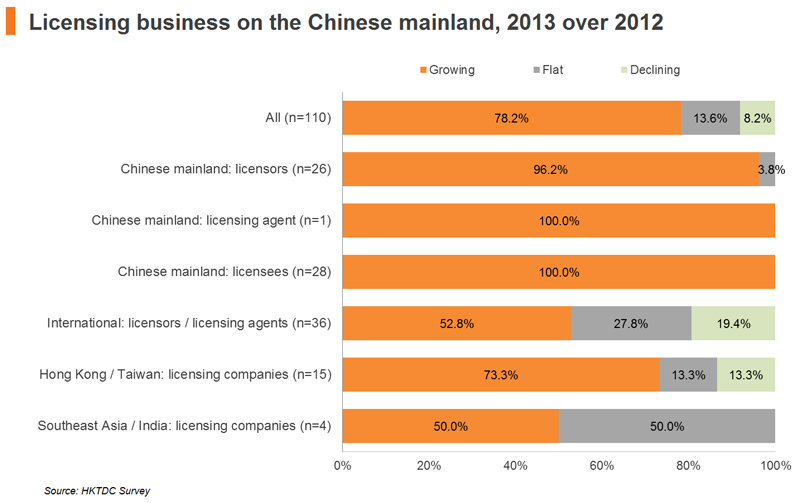 All of the surveyed Chinese licensors, licensing agents and licensees reported positive yearly business growth in 2013. 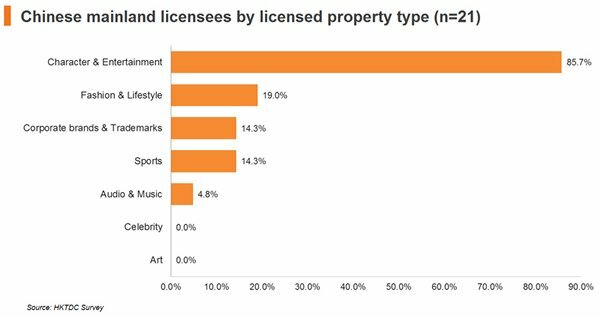 It is worth noting that the booming licensing market on the mainland did not benefit all participants to the same extent in 2013. 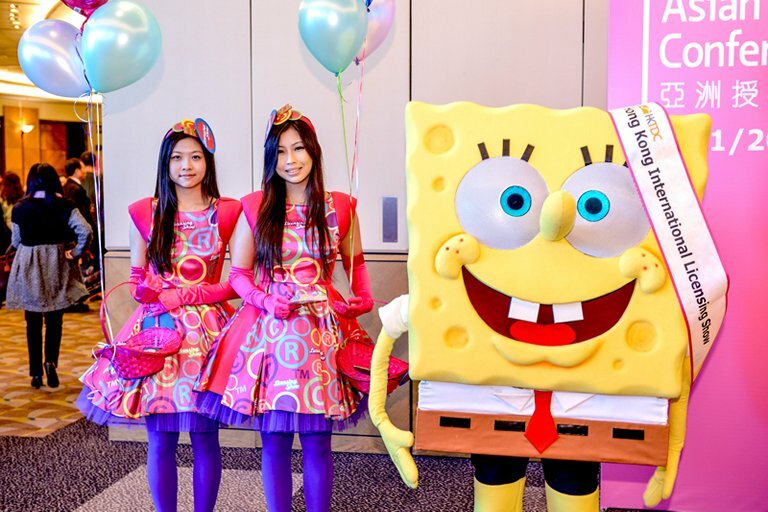 Some 47% of the international licensors and licensing agents, and 27% of the licensors and licensing agents coming from Hong Kong and Taiwan, reported flat to negative growth for the year. They pointed to intellectual property infringement as being among the problematic issues for their operations on the mainland, (Asia’s Licensing Hub Reaches Out to China’s Booming Market). 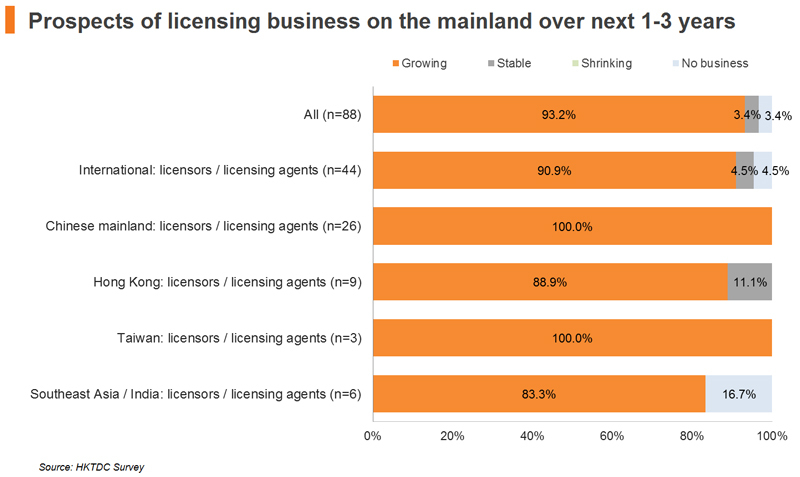 Despite this business setback in 2013, these respondents believed their licensing business on the mainland would improve over the next few years. 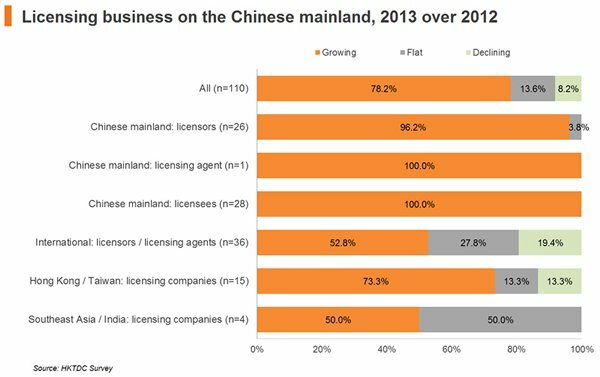 By contrast, all of the surveyed Chinese licensors, licensing agents and licensees expected positive yearly business growth over the next few years. 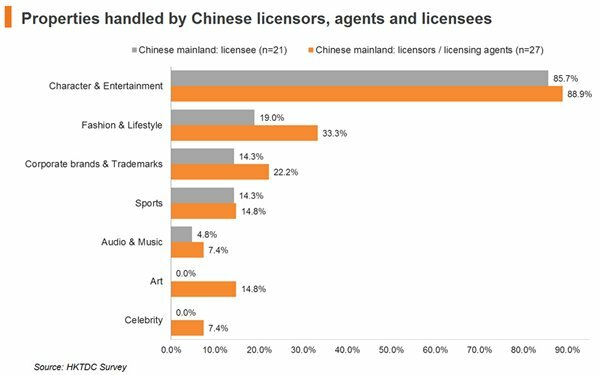 There was general consensus among interviewees and survey respondents that the Chinese licensing market has been dominated by character properties in recent years. A booming emerging market, such as the Chinese mainland, remains largely character-driven. This contrasts with the development history of the more mature markets, notably Japan and Korea, where character-related licensed merchandise reached a saturation point a lot earlier. Based on the views gathered from surveyed mainland licensees, 87% of the licensed properties were in the category of character and entertainment, way above fashion and lifestyle (19%), and brands and trademarks (14%). Although the character and entertainment segment maintains a lead over other properties in Asia on the whole, this lead has been declining following negligible growth in the four years to 2013. Over the same period, fashion and trademark and brand properties posted average annual growth rates of about 5-6% in Asia, (see Licensing Opportunities in Asia: An In-depth Look). On the Chinese mainland, businesses related to product licences, retail licences and promotion licences are all growing, though respondents generally noted that the strongest growth is found in product licensing, by far the largest chunk of all licensing activities on the mainland. Retail licences, while representing a small portion of the licensing pool, are seen as offering more opportunities for integrated sales, counter measures against pirated products, and product differentiation by channel. 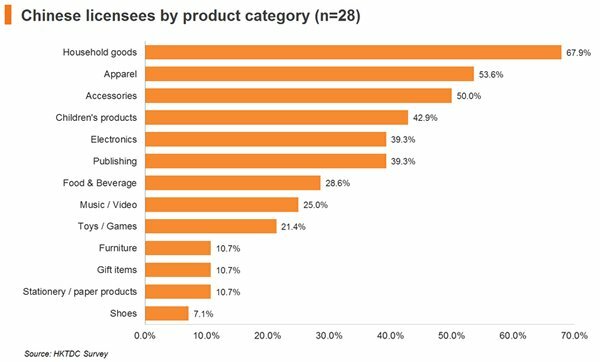 Among the surveyed Chinese licensees, the most common product category for licensed properties is household goods (68%), followed by apparel (54%), and accessories (50%). However, many other product categories also show an increased appeal to licensees, including children’s products, electronics, published goods, and food/beverages. 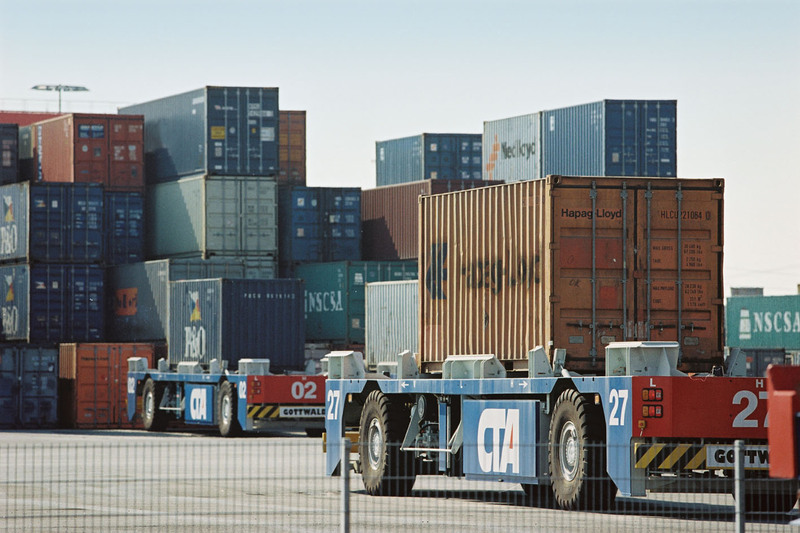 This basically reflects the fact that Chinese entrepreneurs have a growing interest in the surging consumption spree, including Chinese enterprises that have hitherto placed greater attention on the export market, which remains sluggish. Through licensed character properties, they can manufacture products of a higher value geared specifically to the domestic market. China’s economic affluence and increased emphasis on domestic consumption in recent years has led not only to higher sales of licensed merchandise, but has also accelerated the supply of homegrown properties, typified by the hugely successful launch of Pleasant Goat and Big Big Wolf in 2009. 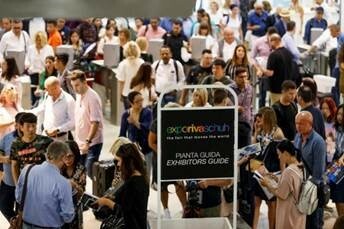 The survey findings show that the US and Europe are the most popular sources of licensed properties (for example, Disney and Warner Brothers characters), with more than three-quarters of the Chinese licencees obtaining properties from these places (79%), followed closely by local properties (68%). The figure below shows that Beijing (54% of responses) was the most popular location from which licensors and licensing agents manage their licensed properties, followed by Shanghai (39%), and Guangzhou a distant third (11%). Nonetheless, the figure above addresses only the location, not the channels, through which the Chinese licensees acquired the licences of foreign properties. Overall, 79% of Chinese licensees were licensed with US and European properties, and less than 10% of them were licensed with either Japanese or Korean properties. It seems that many foreign properties are actually licensed to Chinese licensees by “local agents”, including indigenous mainland licensing agents, as well as overseas licensing agents with localised operations on the mainland (including those from Hong Kong) . 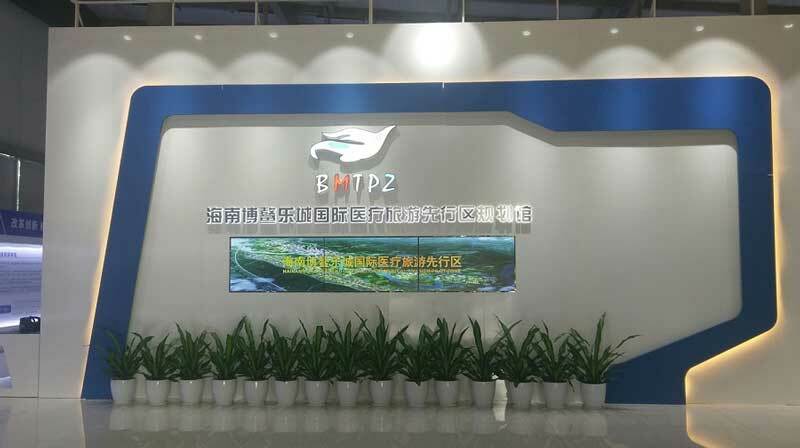 In the previous article on the experience of international licensing companies in the mainland market, it was revealed that half of them would use local agents in China, with Shanghai proving the most popular location for them to conduct licensing business (see Asia’s Licensing Hub Reaches Out to China’s Booming Market). 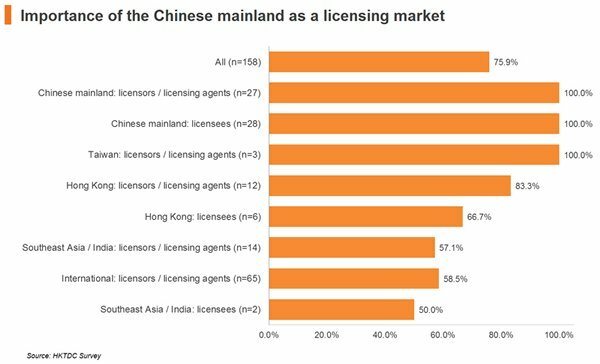 It was also indicated in another article (Capitalising on Licensing Opportunities in Asia via Hong Kong) that some of these Chinese licensees (21%) had actually acquired overseas properties via licensing companies based in Hong Kong. Worth highlighting is one particular survey finding – it is Beijing, rather than Shanghai, that is where the majority of Chinese licensees obtained their property licences, and where their licences are managed. 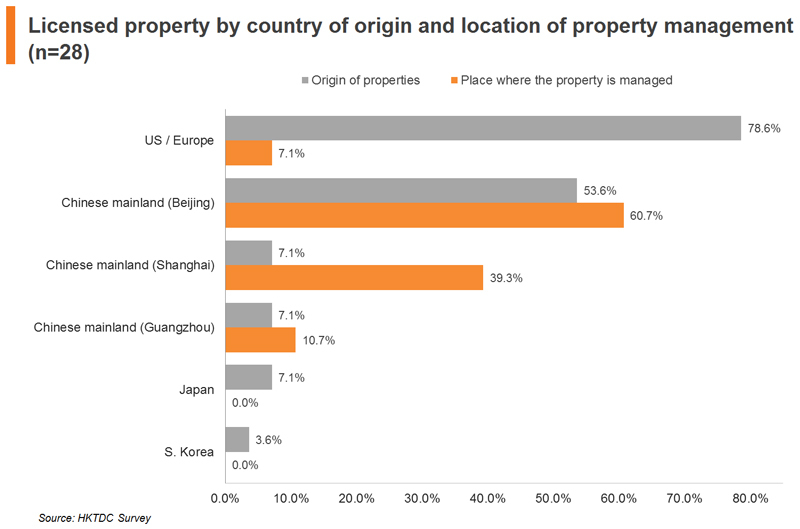 It appears that for licensees to get better access to homegrown properties for the time being, Beijing would be a more popular location, along with it having a greater supply than any other mainland city. 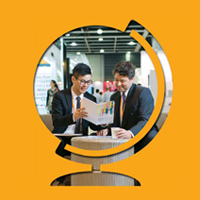 International licensors and licensing agents, however, should take note of this and review their locational conditions in order to better reach out to Chinese licensees. With regard to the types of properties handled by the Chinese respondents, characters were the most important type, with not much difference in the responses between the licensors and licensing agents versus the licensees. However, the response gap of the properties handled widens in terms of all the other non-character properties, in particular fashion and lifestyle as well as art properties (each of which has a response gap of more than 10%). Understandably, the majority of surveyed Chinese licensees are manufacturers, who are currently focussed on applying character properties to their products. Licensors and licensing agents reported that far higher proportions of their businesses centred on product licensing, rather than on retail or promotion licensing, as indicated earlier. In other words, the surveyed Chinese licensees have yet to advance to the stage of applying art or celebrity properties to their products or services. This is even though the licensors and licensing agents stand ready to supply such property licences (as some licensors and licensing agents are localised operations of overseas licensing companies, whose portfolios consist of non-character properties). As the licensing market on the mainland continues to mature, the licensing of art and celebrity properties is expected to increase, for example, with the adoption of retail licences in order to promote integrated sales and product differentiation by channel. The sharply increased sales of licensed merchandise reflects the fervent interest of Chinese consumers in obtaining goods enriched with licensed properties, balanced against the intensified efforts of licensors and licensing agents in informing their would-be customers of the value of the licensing proposition. 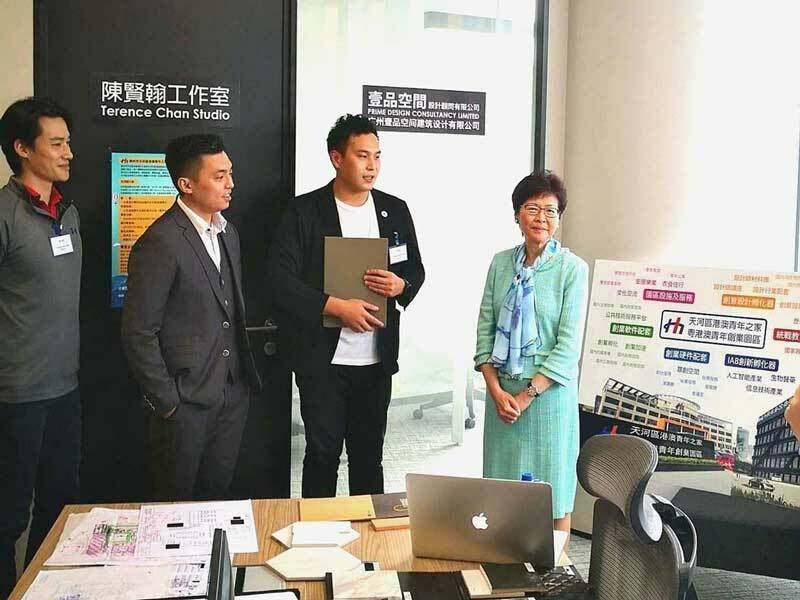 The number of homegrown licensing properties on the mainland, in particular locally produced characters, has dramatically increased since the late 2000s. These include popular characters such as Pleasant Goat and Big Big Wolf (喜羊羊與灰太狼), Balala the Fairies (巴拉拉小魔仙), Amour Hero (鎧甲勇士), Boonie Bears (熊出没), and Big Ear Tutu (大耳朵圖圖). However, there are still too few suitable licensees that have an adequate knowledge of the licensing business, possess the capacity to plan and design well, or are able to produce high quality products that will spur consumers into buying (100% of responses in the figure below). Despite the surge in licensed product sales on the whole, along with the greater number of locally produced characters, many Chinese licensees of character properties find it difficult to introduce new products with the touch points that appeal to consumers, and they acknowledge that they lack the marketing skills to increase consumer awareness (25% of responses). 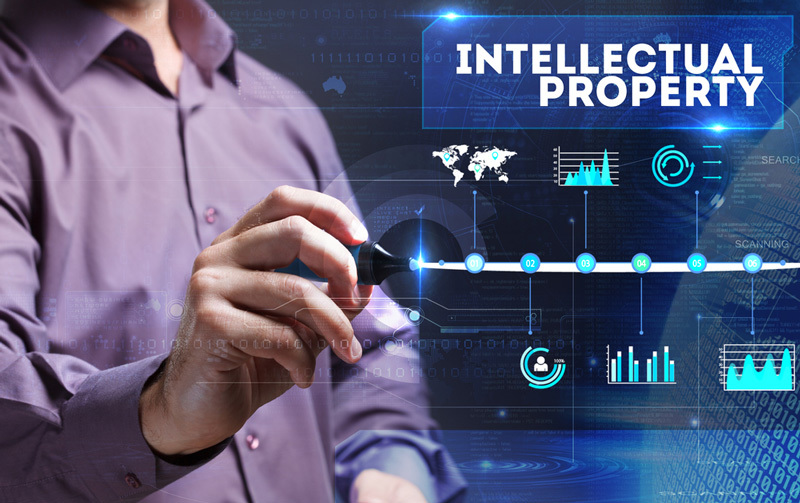 Many issues need to be resolved before there can be any further development of the licensing market on the Chinese mainland, typically these relate to intellectual property infringement, which concerns all licensing companies, local or overseas. Among the Chinese licensees, 86% reported “no improvement” in their overall assessment of the issues compared to 2010, with only 14% regarding the problems as “in the process of improvement”. For example, Chinese companies licensed with legitimised properties would be hurt by the presence of many imitation products if they could not roll out products that can be readily differentiated from fakes. Admittedly, many of the problems facing the licensees fall within the realm of the licensors and licensing agents, and they would be in a better position to co-operate with the licensees in order to tackle them. For example, licensing agents could move beyond simply issuing “style guides” to Chinese licensees, most of whom are manufacturers with weak product planning capabilities, and propose more concrete product designs to assist the licensees. 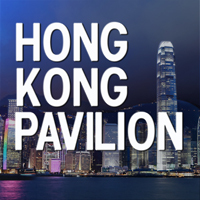 For the purpose of conducting the questionnaire on a geographical basis, those licensing companies originating from overseas (including Hong Kong) while operating on the mainland were counted as mainland licensing companies. In this connection, among the 55 mainland respondents covered in this part of the questionnaire, 27 were counted as mainland licensors and agents (even though they comprised the subsidiaries of overseas licensors and licensing agents, while the overall respondents group consisted mostly of primarily indigenous mainland licensors). The remaining 28 were mainland licensees.